I had the opportunity to check out the Godrey Hotel's new restaurant, Dolce Italian, this past week as I planned a lunch date with some special ladies. My cousin, who is also a writer and blogger was in town with my aunt and with her daughter who works in communications and was in town for a conference. They all live in the Springfield area and it was so nice to have a chance to sit down and enjoy some time with my cousin and my aunt, whom I haven't seen in a couple years, and to enjoy a fabulous meal with this lovely setting as our meeting spot. The new eatery opened in May in the award-winning luxury lifestyle Godfrey Hotel that also offers 221 rooms and suites and the 110 Urban Roofscape, the largest hotel rooftop dining and event space in Chicago. It also boasts a boutique spa and state-of-the-art fitness facilities. LDV Hospitality’s Dolce Italian was named America’s “Best New Restaurant” in the first season of Bravo’s culinary competition series Best New Restaurant. With 16 restaurants competing from New York, L.A., Miami and Austin, Dolce Italian came out as the winner and earned an impressive feature in Bon Appétit, a featured spot at America’s number one global food festival, Vegas Uncork’d by Bon Appétit 2015, and $100,000. There are now locations in Miami, Atlanta and Chicago. We each started off with a glass of prosecco and some lovely crusty Italian bread. They had prepared some of their signature dishes for us to sample, including this Tuna Tartare with yellowfin tuna, seared fennel, avocado, romesco and mandarin, topped with microgreens and served with some crispy zucchini chips. It was one of those culinary works of art with such an amazing presentation that you hate to ruin the beauty by taking a bite. But my all means, dig in. Your taste buds will be thrilled with this great blast of flavor. We also sampled the Watermelon Salad, which included watermelon, heirloom tomatoes, fresh mint and pumpkin seeds with just a tiny bit of goat cheese. Watermelon salads such as this one have become a favorite seasonal salad of mine. I've often had it with grilled watermelon, which is amazing. This watermelon didn't appear grilled, but it was ripe and juicy and paired so well with the sweet yellow heirloom tomatoes. This is the kind of salad I could eat for every meal and never tire of it. It's the ideal summer salad - super refreshing! The final dish they had prepared for us was the Tartufata Pizza. Again..a culinary art piece that you hate to disturb. Takes pizza to a whole new level. I prefer thin, crispy crust (I know, what kind of Chicagoan doesn't go for the deep dish first?) and this just might have been the best crust I've ever experienced. Now I've never been to Italy...but, I imagine this is probably a pretty authentic crust, but even prettier. Now about the pizza, it contains one of my favorite ingredients and one that's trending in the foodie world, truffle oil. Truffle oil seems to be one of those love 'em or hate 'em foods with a strong, pungent aroma and taste that can be a turn off to those who haven't had it before, but I'm smitten with it. The spicy salami gave it a bit of a kick. Ok, any sane person would have stopped after those goodies, but the pastas sounded wonderful, so we ordered a couple dishes to share. One was the Fettuccine Al Pesto with gulf shrimp. While fettuccine noodles are often served with a heavy, but delicious, cream sauce, this dish goes lighter by replacing that sauce with basil pesto...and boy, what a winner it is! This is an ideal lunchtime dish when you want something a little more substantial than a salad, but that still doesn't feel so heavy. And as with everything else we tried, the presentation was exquisite. 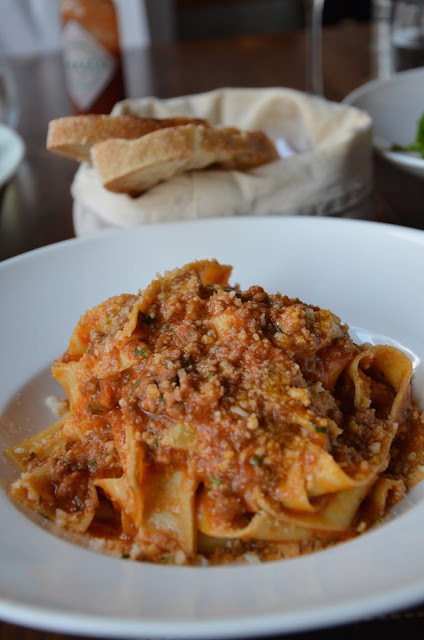 We also tried the Pappardelle Alla Bolognese with braised pork, beef and veal ragu. For those who love a meaty sauce with their pasta, this will fit the bill. Sprinkle on some fresh parmesan and you've got a perfect pasta dish to please. With tiramisu, one of my all-time favorite desserts, as a dessert selection, I just couldn't pass it up. I don't drink coffee, but adore tiramisu - I know, I know, doesn't quite make sense. This version was particularly fluffy and we each enjoyed a couple bites to end our meal. Dolce Italian is open for breakfast, lunch and dinner in the chic dining room with plenty of sunny views of the bustling Chicago street. The dinner menu includes some of the items we tried as well as an expanded entree list with halibut, salmon, veal, steak and rack of lamb. To view a full menu, click here. After lunch we were off to shop at Water Tower Place, fueled by our fantastic meal and great conversation.